All her foibles aside, I've always been kind of a QUEEN ELIZABETH II fan because the way she does her hair reminds me of my grandmother. And you know she's always fashionable in her monocolor outfits. And now, she's finally found the perfect accessory--a book! 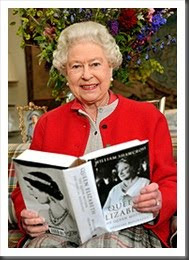 Here she is with QUEEN ELIZABETH THE QUEEN MOTHER: THE OFFICIAL BIOGRAPHY, about her mum. The book seems to weigh as much as she does, but she's not letting that stop her. Rock on, Your Majesty!